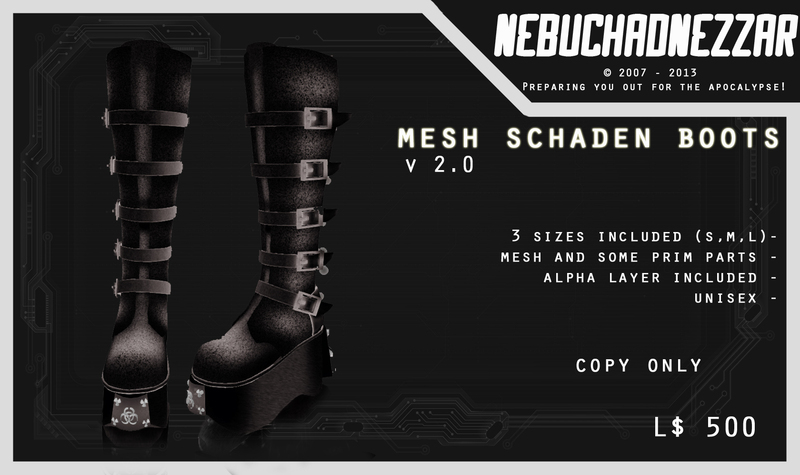 Today Im releasing the second version of the Mesh Cyberlox, and at this time is unisex! It comes as unique size, can be fit on female or male shape, rigged, 7 colors of choice, no hairbase included. 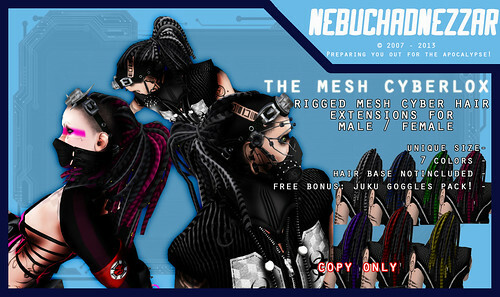 This is the new two releases for today : The Mesh Cyberlox Hair Extensions and Cyber Industrial Mask Top! The Mesh Cyberlox pack is the first rigged mesh cyberlox extensions from NDN, with 8 colors included on pack, and a free bonus for you! Juku Goggles pack inside on the box! And the Cyber Industrial Mask Top is great for clubbing at industrial, aggrotech, ebm music sets. 6 colors included on pack. Go clubbing with this awesome cybergoth outfit. 6 colors of choice, 100% rigged mesh, 3 standard sizes included, and alpha layer! If you already love your first version of the classic Schaden Boots, you gonna love this version two! This unriged mesh boot is unisex, in circuits version or normal version, comes with 3 standard sizes, and alpha layer for your feet. For the cybergoths, rivetheads, and platform boot lovers! Mesh User Addicts: Cannot see mesh or having issues seeing? Read it more! So you have the latest viewer (Phoenix 1600 or later, Firestorm 3.2.2 or 3.2.1, or later) and still can’t see mesh – what’s the deal? Well, it isn’t necessarily automatic. Depending on your specific hardware, certain settings that need to be enabled for mesh, may be set off by default. If either of those remain greyed out, then increase the level of Render Quality until they become enabled and can be checked. In some cases, worn mesh attachments will not render properly still. Go to Preferences → Graphics -> Rendering and disable both of the Alpha Mask Rendering options. If none of the above work – and make sure you try all of them first! – then in the top menu bar, open Advanced → Debug Settings, find MeshMaxConcurrentRequests and gradually increase the value. It is recommended that you not go over 64; try to keep it less. On occasion the mesh queue can get stuck. If this happens, you will see a message on screen saying so. This affects Firestorm 3.2.1 and 3.2.2; fixed for next release. Our JIRA ref: FIRE-4020 – inherited from LL code: SH-2568. If affected, Open the debug settings, find MeshMaxConcurrentRequests and bump the number up until it shows, once mesh renders please reset to default to avoid causing excess lag. If that fails the only workaround is to relog. Worn, rigged mesh containing any alpha in the texture will not render when Preferences → Graphics -> General → Lighting and Shadows are enabled. Our JIRA ref: FIRE-4018 – inherited from LL code: SH-2831. No workaround yet, apart from disable shadows or use 3.2.1 (this is only a bug in the OGL builds). Mac users: The issue may be related to DNS, especially if it is combined with crashes or disconnections on all or most teleports and/or an empty friend list. See the “Mac-specific” section of this page for instructions and further explanation. If either of those remain greyed out, then increase the level of Quality and Performance until they become enabled and can be checked. In some cases, worn mesh attachments will not render properly still. Go to Advanced → Rendering and disable both of the Automatic Alpha Mask options (Press Ctrl-Alt-D if you cannot see the Advanced menu). Textures can change by clicking on the facemask. As the item is a mesh object, you must have a enabled mesh viewer .